Is emergency management education undoing an age-old tradition in the American Fire Service? 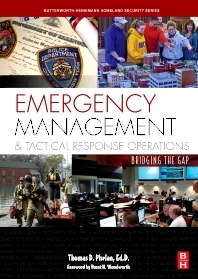 Has the time arrived to educate emergency managers in college classrooms rather than in twenty years of tactical operations experience? Over one hundred forty-three (143) institutions of higher education are now offering certificate or degree programs in emergency management with no tactical operations experience required for admission. Resistance by veteran law enforcement officers and fire fighters may have to be overcome if we are to prepare emergency managers with required skill sets. Dr. Tom Phelan explores the skills being taught to emergency management students and addresses the concerns of experienced first responders in accepting their leadership. Discusses the value of emergency management education in the post-9/11 world Makes clear the need for educating emergency managers to prepare them for emergency manager leadership Helps bridge the gap between emergency management and first responders Should be required reading in every college emergency management curriculum *The book is clear, concise, and an "easy read"